I have (had, maybe still have, we shall see) an account on Gab. It got as far as being Gab.com before it was deleted. It was a lot like Twitter but a bit more mad. Was there rabid antisemitism on there? Oh hell yes, but it had a mute button to turn those nutters off. Just as I can turn off antisemites on Twitter, where they seem to do just fine with management blessing. Was it possible to get banned from Gab? Yes, if you started inciting violence or criminal acts or anything that was against the law. Gab’s premise was ‘free speech’ with the proviso that free speech has consequences. If you break the law on Gab, they will pass your details to the relevant authorities and shut down your account. But only if you break the law. There are other ways to get banned, but that’s the big one. You might or might not like Gab. There are many online social group things I don’t use. I have a Farcebook account but don’t do much with it other than put up these posts. Snapchat does not interest me at all, but it seems popular with a lot of people. I am not interested in banning things I don’t like. Other people like them, I am not forced to use them, so they slide off my radar. There are exceptions of course. Terrorist and paedo sites for example. Still, if they are banned, they will just go underground and be harder for the police to monitor. Is there really an Underweb, a ‘dark web’ where the real freaks hang out? Is that possible? I once worked in a place with a computer network run by a whole host of IT staff. One staff member was not part of the IT group and did not like their limiting of internet access. So he set up what we called the Rebel Network. It ran the same routes as the official network. It ran on the same computers if you knew how to log in to it. It bypassed every control the IT department put in place. The IT department had not found it by the time I moved to another job. I never heard whether they ever did. It’s there, on your wires, in your WiFi and if you don’t know the login protocols you will never find it. No special equipment, no separate wiring, it runs the same routes and it’s a lot more sophisticated than that old one-company rebel network – and there’s a kicker. There’s more than one Underweb. Gab has not gone to the Underweb. It is staying open, when it resurfaces (and it will) because Gab is not doing anything illegal. Nor does it condone, far less encourage, illegal activities. I quite like Twitter but it is becoming clear that, increasingly, you have to be careful what you say on there. Very careful. If you fit the narrative, fine. You can be as abusive as you like against the right targets but say one word against the wrong targets and you’re gone. You have to think about every post before sending. It feels like the pubs just after the smoking ban. You can still go there but they don’t feel comfortable or welcoming any more. Gab is a pub that still allows smoking. When the Pittsburgh loony shot up a mosque, it transpired he had an account on Gab. He also had Farcebook and Twitter accounts and possibly other social media accounts too. Those were ignored. Paypal immediately cut ties with Gab and their hosting provider has now ditched them. Within days of the event. What did Gab do when the loony went postal? You can read their statement for yourself. They immediately passed all the information they had on the shooter to law enforcement. They were not pressured into it, they were not subject to any kind of legal challenge, they passed the info at once. The shooter hated Trump but that does not mean he was a Democrat. His politics are unknown, other than that he was a rabid antisemite. The van picked up covered in Trump stickers was an embarrassingly obvious made-up thing. It was not plastered in stickers. The windows were covered in large printed sheets of lots of images from stickers. The edges of those sheets were perfectly straight, beyond the capabilities of the most OCD person out there. Also, he had repeatedly stated he hated Trump (he believed Trump was a Jew-controlled puppet) so the sticker-laden van simply does not work. I left out the original poster’s ID because I didn’t have their permission to ID them. The current climate on Twitter could land them in trouble. Have you ever seen Twitter or Farcebook threatened like this when one of their members goes on a killing spree? What is so special about Gab? It’s not controlled by the narrative. It is not ‘alt-right’, it’s crawling with the worst of the Left too but there is a difference. The Left do not have control of the site. They cannot just get their opponents banned or silenced by whining to the boss. They are on their own in there, they have to make their arguments clear and they have never really tried to do that. Gab makes it clear that they don’t know how. All they have is programmed rhetoric and shouting down the opposition. That’s why the NPC meme hit them so hard. It’s because it is very, very close to reality. Like Cybermen, those they can’t assimilate must be deleted. 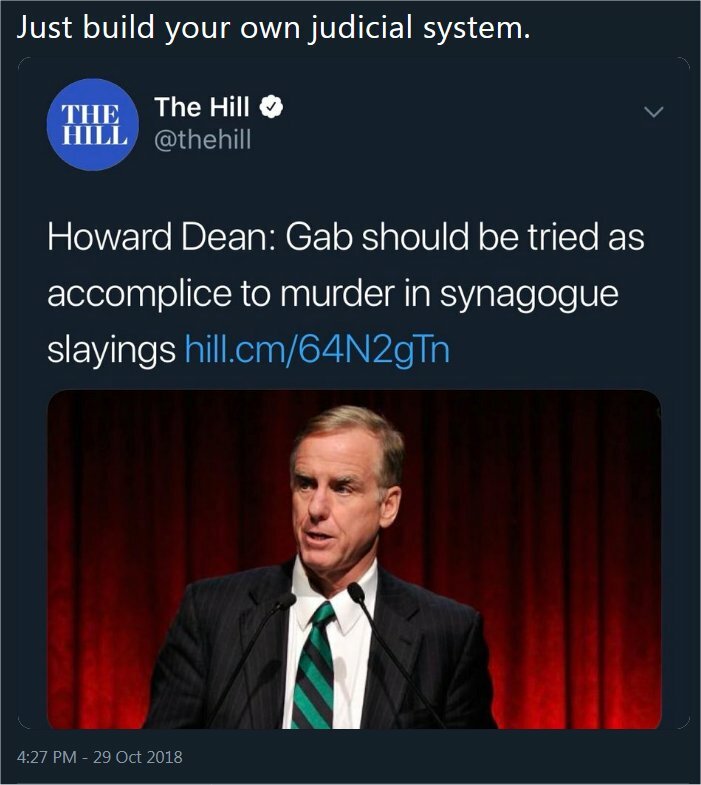 Maybe you despise Gab. Well, it’s simple. Don’t go there. If the left believe it is full of alt-righters (a name they coined without realising that the corollary is ctrl-left) then either flood it with free speech lefties and debunk the arguments they find, or simply ignore it. They are incapable of doing either of those things. All they can do is shout, in a Cyberman monotone, ‘Delete!’ And in doing so they have given the site enormous publicity for free. The Ctrl-Left tag is becoming more and more apt, and they are doing this to themselves. There is major chaos coming and I have prepared for this well in advance. I have a massive stock of popcorn. It was the fake bomb sender with the perfectly aligned sticker van that supported Trump. The shooter with the GAB account hates Trump. Of course. These things are coming up so fast now it’s hard to keep track. Yesterday someone shot up a Republican office, I haven’t seen the news for todays’madness yet. I’d not heard of it, but now I know why. Looking at the Wayback Machine, there was nothing on the dot com two months ago and the domain name was bought in September for $220,000 (previously, it was gab.ai). Gab’s Annual Report gives much to be concerned about, including warnings about current and future government regulations and their reliance on Microsoft’s Azure hosting platform (and MS has already threatened to ban them before the latest massacre). Their mobile app wasn’t approved by Apple and they are worried that Google Play will remove it. I was amused to read elsewhere that “far right” shock jock and likely Establishment poodle Alex Jones is one of Gab’s main attractions. I won’t be investing. In fact, the whole thing smells fishy. Is it a psy-ops to prepare the population for even more censorship? Have you noticed that many US websites are no longer available here due to them not complying with the latest EU ‘privacy’ (haha) laws? Why should they have to? Perhaps censorship was the real purpose. If surfers didn’t know that most websites leave cookies then they shouldn’t be surfing. And finally, Cyril, Twitter and FB seem rife with anti-Semitism. I recently unfriended someone on FB who has an OCD about posting anti-Jewish nonsense. A lot of fake conspiracy “truthers” have been stoking the fire for years on YouTube, etc. Very fishy. Don’t expect freedom to be resurrected any time soon. I think they were kicked off Azure when they were gab.ai, moved to another to become gab.com and have now been booted from that one too. Really though, like Twitter, it’s all in how you use it. I will mute and ignore the loonies, engage with the sensible ones and use it to promote the blog and Leg Iron Books. I didn’t know Alex Jones was even on Twitter until he got banned and don’t care if he’s on Gab. Seems to me most of their problems are not so much political as commercial. They are setting up as a serious rival to some big companies and the big ones don’t like it. Still, blaming them for the actions of a loony who just happened to have an account there is a very risky move for those big companies. They have had manymore loonies in their member lists. I just have the free account on Gab. You can buy a ‘pro’ account with lots of features but I don’t need them so far. The free account is good enough. The EU’s restrictions have put several overseas news sources out of reach unless you go through a US proxy. If we ever manage to leave, Tessie won’t change that. Control of the internet was something she salivated over as Home Secretary. We can only hope she is replaced by someone with a few Tory brain cells left. I wish I had your faith! It can’t be allowed to happen. It’s reaching a point where if the Tories don’t make drastic changes they will lose all their votes. And I don’t see those votes going over to Labour as long as Stalin’s Little Helper is in charge. So either those voters won’t turn out or they’ll vote for one of the new ones, which is always a risk but what other choice is there? I was/am on Gab. We wait to see what gives. I suspect they’ll be kept offline until after the US elections. Mostly because they don’t push the required narrative. According to Have they should be back up and running by the weekend although they’re trying to get it done sooner. I’ve followed you for a long time, because you talked sense. However, this article dismayed me. How could you confuse the inept would-be bomber with the synagogue shooter? “Things coming up so fast” is not a valid excuse. I don’t live in the US, or the UK. But, even here on the fringe, our media made a clear distinction between the two events. There’s a lot more than just the news coming up fast here – it’s a really busy life at the moment. However, you are correct, and I will be correcting the post tonight.